I am impressed with this technical indicator, and you will also be, if you know the Elliot Wave Theory, which was named after the Ralph Nelson Elliott, the proposer. The theory was inspired by the Dow Theory and observations in the nature. Elliot Wave Theory believes that the actions are followed by reactions. Elliott's five waves to a direction consist of total 8 waves, the waves are marked as 1, 2, 3, 4, 5, a, b, c. The 1, 3, 5 waves are the impulsive waves which are to the direction, and the 2, 4 are the corrective waves just opposite the direction. The a, b, c waves indicate the reversal of the trend. The Elliott Wave Oscillator is an technical indicator developed on the Elliott Wave Theory to apply the theory in trading effectively and efficiently. When we manually draw the Elliott waves on the price chart, we often ignore the small corrections of the trend. This oscillator picks the waves effectively, and gives the entry and exit signals. This indicator is similar to MACD histograms and awesome oscillator. Here in this indicator, no signal line or change in the color of the histograms exist. The indicator can be interpreted without any complexity.When the histograms make a top, it indicates that the bullish trend is going to be slower or to be reversed. On the other hand, when the histograms make a bottom, it indicates that the bearish trend is going to be slower or to be reversed. Zero line crossovers indicate the probability of a strong trend towards the direction. 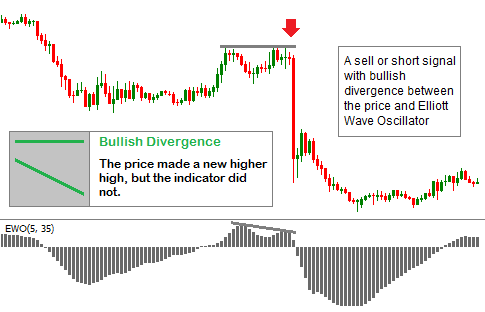 The popular bearish convergence and bullish divergence techniques with this oscillator are also applicable. Here in the above image the bearish convergence between the price and Elliot Wave Oscillator is drawn. 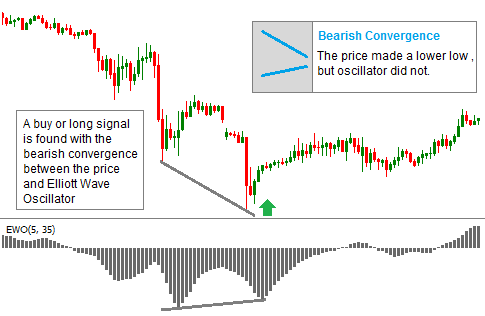 A bearish convergence is found, when the price makes a lower low, but oscillator does not. Here you can learn the 3 bearish convergence patterns. In the above image bullish divergence between the price and Elliott Wave Oscillator is drawn. A bullish divergence is appeared when the price makes a higher high, but the oscillator does not. Here you can find the 3 bullish divergence patterns. Dear traders, hope you have introduced with a new effective technical analysis indicator to speed up your forex trading journey. If you have any difficulties in application or interpretation of this indicator, you can drop a comment below. I will be very happy to response to your comments as early as possible.